The TH-3070-UT is highly durable and extremely strong. This mount supports screens that weigh up to 200lb and offers 20 degrees of tilt adjustment (15°+ to -5°) which can be set post installation. 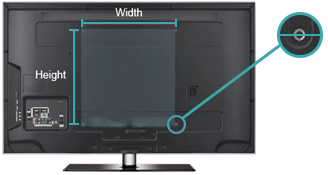 Very simple to install, the TV is held just 2.85" from the wall for a display that's streamlined as well as flexible. By adding a padlock your screen is safe and secure thanks to the theft resistant design.